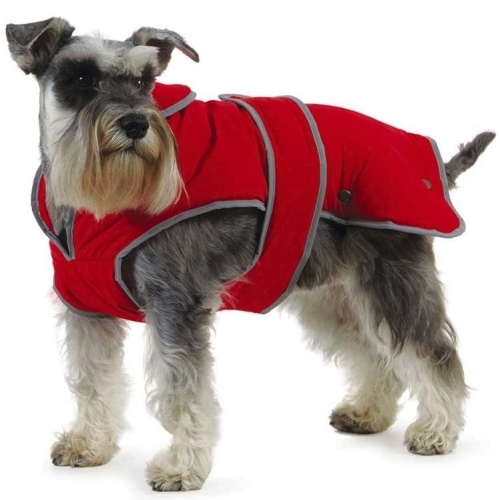 Ancol Muddy Paws Stormguard Red Dog Coat with Fleece Lining is a luxuriously warm coat, which is certainly going to keep your dog dry and cozy for a lifetimes worth of walks. Made from a heavy nylon and lined with a warm fleece, this Stormguard coat has been inspired by professional outdoor pursuits equipment. Featuring a full chest protector, your dog won't feel a chill. Finished with a lead attachment slit and reflective edges that ensure your dogs visibility during dark hours. The Stormguard coat will comfortably stay in position over your dogs back with thanks to its adjustable Velcro fastenings and elasticated leg straps.